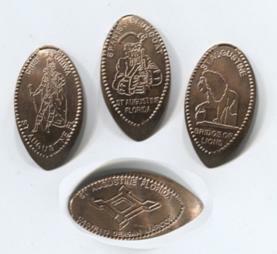 Set of 4 – museum logo; Jack Sparrow; Elvis Presley; and Harry Potter. This machine has reportedly been converted to cost a dollar and to dispense tokens instead of your penny. 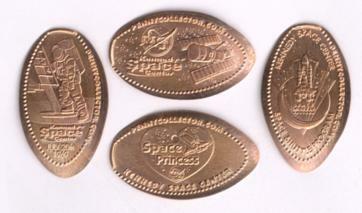 These have always been among my best sellers, but time is winding down since I don’t visit the Space Center anymore. 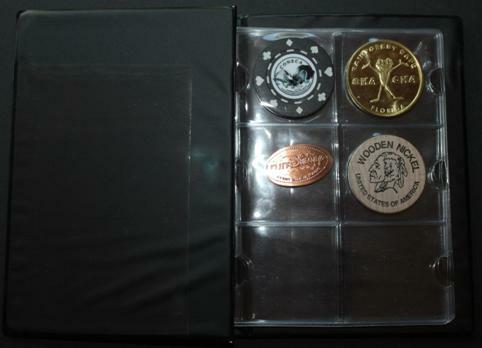 I have a limited quantity of coins from single machines. Each set of 4 pennies will cost $6.99. I no longer have the quarters. 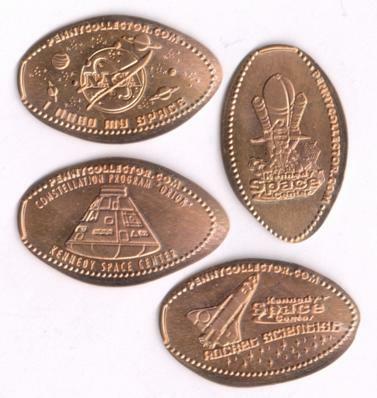 Check my article about the space center machines and identify any coins you need by machine number. 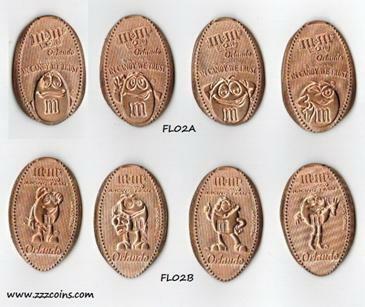 I do not sell individual coins. 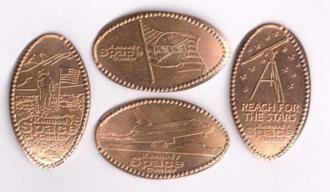 1) Astronaut on moon with U.S. flag (V); 2) NASA logo on U.S. flag background (H); 3) Telescope with “reach for the stars” (V); 4) Space Shuttle landing (H). 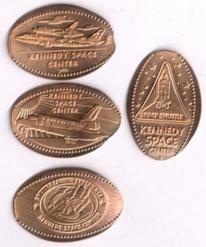 1) Saturn V rocket (Roman numeral “V” for “5”) (V); 2) Rounded NASA logo with 6 stars (H); 3) Mars Rover (V); 4) Space Shuttle with flag background (without “Kennedy Space Center” on coin) (H). 1) Shuttle on Boeing 747 (H); 2) Shuttle with sunshine background (H); 3) Shuttle Launch Experience logo (H); 4) Triangle logo with Shuttle (V). 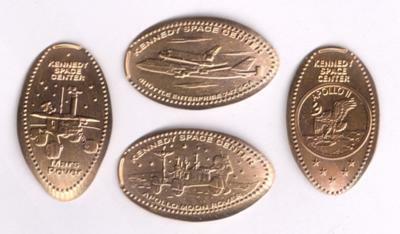 1) Mercury 7 round logo (V); 2) Shuttle landing with parachute, inscribed “Atlantis Space Shuttle” (H); 3) triangle logo with Space Shuttle (V); 4) Shuttle on Boeing 747, inscribed “Shuttle Atlantis 747 SCA” (H). 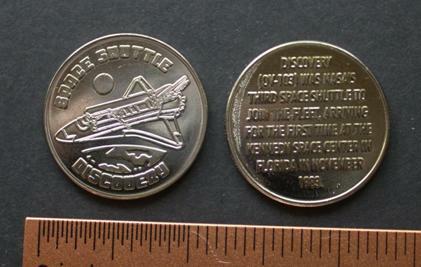 1) Shuttle with cargo door open and arm extended with “Florida, U.S.A.” (H); 2) “Shuttle Launch” without “Kennedy Space Center” on coin(V); 3) flat NASA logo with “Florida USA” (V); 4) flat globe view of Western Hemisphere with “Florida USA” (V). 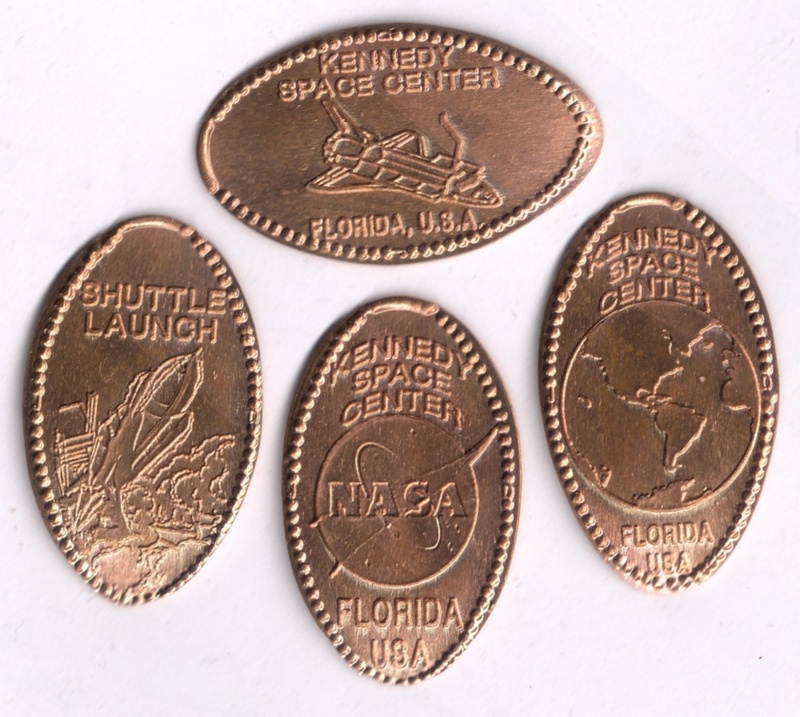 1) Apollo XIII logo, inscribed “failure is not an option” (V); 2) Saturn V rocket launching (V); 3) Lunar Rover (V); 4) close-up of astronaut on Moon (H). Many years ago, this machine was located at the Right Stuff gift shop. 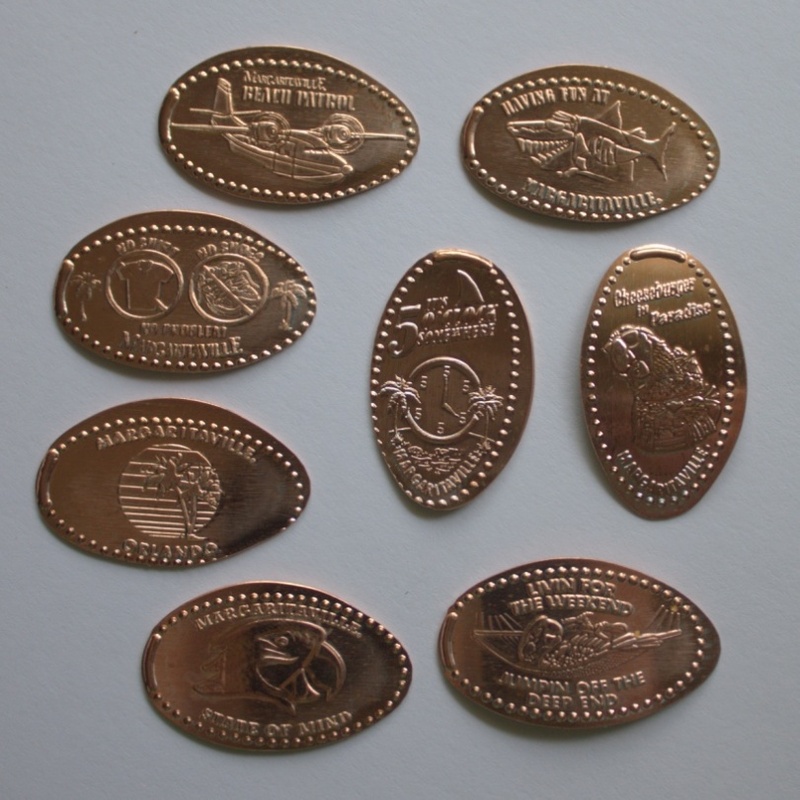 I have pennies from 5 different machines – 2 were retired prior to 2016, and the remaining 3 were retired during 2016. 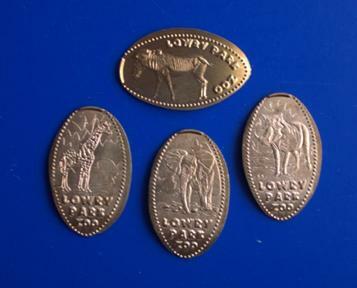 Designs: The machine numbers come from the www.pennycollector.com website. 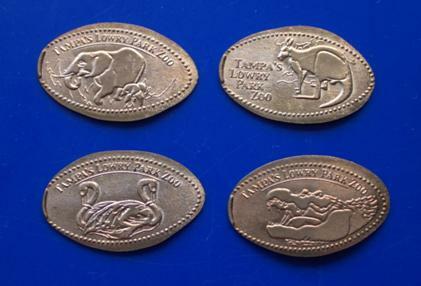 Machine 4: flamingoes; elephant; wallaby; alligator. 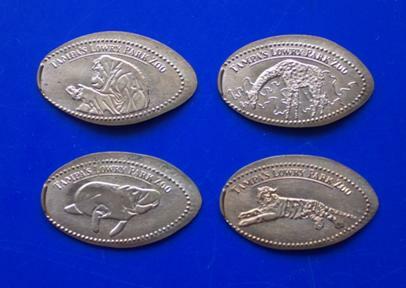 Machine 5: elephant; giraffe; warthog; zebra. Machine 6: manatee; tiger laying down; giraffe bending to eat; orangutan. Machine 7 (not pictured): panther; penguins; koala; pony ride. Machine 8 (not pictured): gorilla; ray; camel; komodo dragon. Designs: running dinosaur; pirate; butterflies; sauropod (dinosaur). Facing tremendous financial pressure, the museum was downsized in summer 2017 and the machine removed. 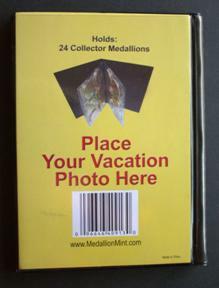 It was returned in 2018. Bass Pro Shops - complete set of 4: Alligator; bird; Bass Pro logo; sailboat in sunset. Designs: Thomas Edison & Henry Ford Winter Homes - complete set of 4: Thomas Edison; Edison phonograph; light bulb; Ford Model T.
These designs were altered in 2015. 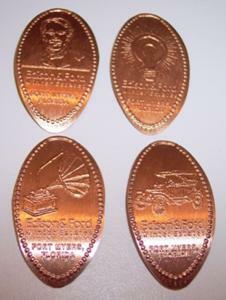 Although the same basic designs were retained, the pennies added that year have the “Pennycollector.com” name in the border. 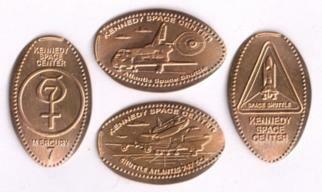 This set has the older design. Old Town is a shopping and amusement district along the Irlo Bronson Highway near Disney World. There are three machines at this location (a fourth machine at the Rootin’ & Tootin’ Shooting Gallery was removed in late August 2016). Each machine is available separately. An 8-die machine was added to this attraction on I-Drive. It presses shiny zinc pennies on coins supplied by the machine. Sponsorship changed in 2018, and these designs were retired. The famous wax museum made its debut in Orlando on May 4, 2015 at the I-Drive 360, an attractions building that also includes the Sea Life Aquarium and the Orlando Eye giant Ferris wheel. Yes, “Tussauds” no longer has an apostrophe. I checked. 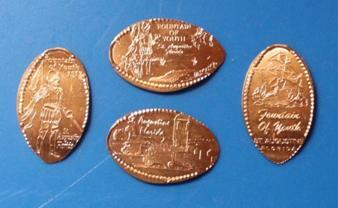 Complete set of 4 pressed on uncirculated pre-1982 copper cents. In 2019 they switched this machine to provide zinc pennies, and they doubled the price. 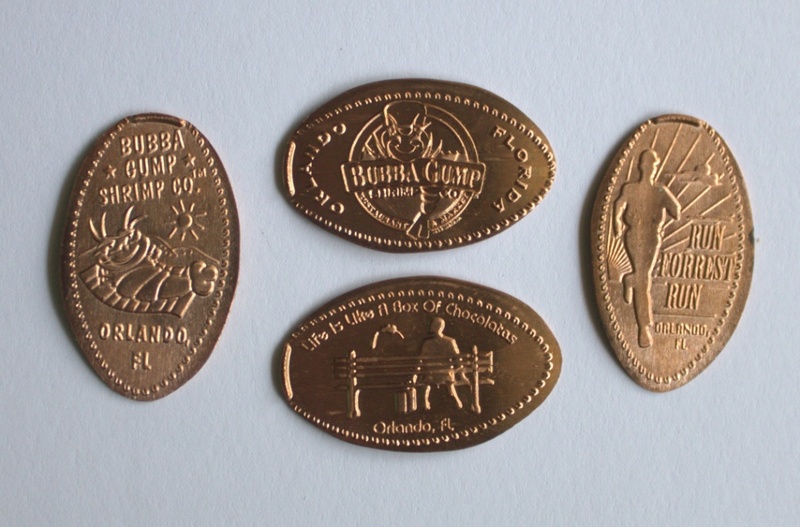 These copper cents we offer are now a thing of the past. This aquarium is also part of the I-Drive 360 attractions building that opened in 2015. 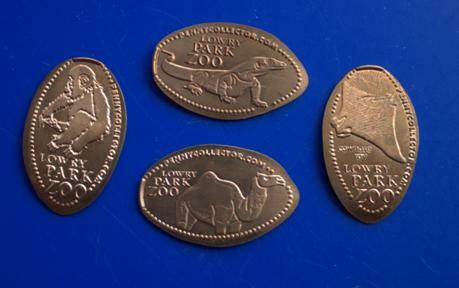 This is a complete set of all 4 coins from the attraction, pressed on uncirculated pre-1982 copper pennies. In 2019 they switched this machine to provide zinc pennies, and they doubled the price. 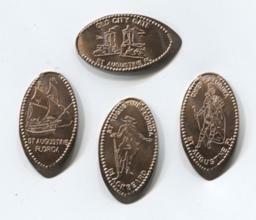 These copper cents we offer are now a thing of the past. The Crayola Experience opened at the Florida Mall in Orlando in July 2015. A 4-die hand-crank machine is found in the attraction area (I do not have these sets), and an 8-die machine is located in the massive store. 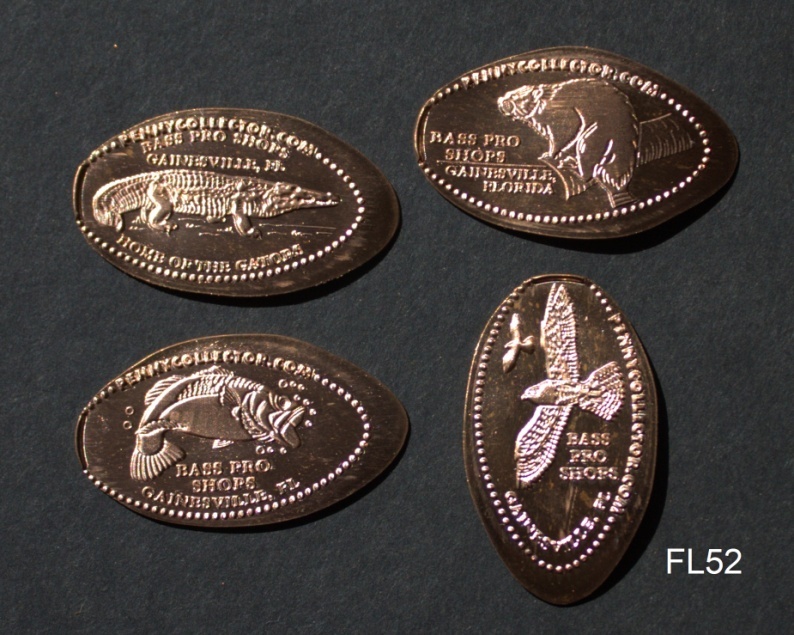 I am offering the 8-coin sets here. 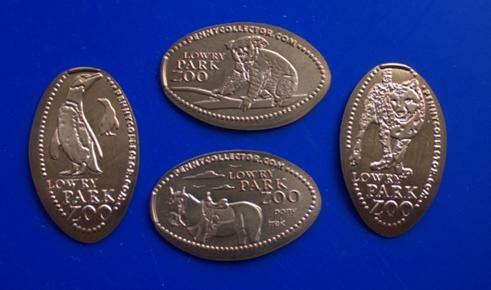 Note that one coin (bottom left corner) always rolls slightly short. 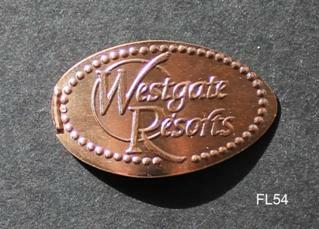 Although some websites have reported that this machine dispenses copper pennies, it actually uses shiny zinc pennies. 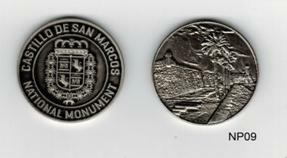 As a result, the coins offered here are zinc. One of two stores at Orlando’s airport added a new machine in October 2015. 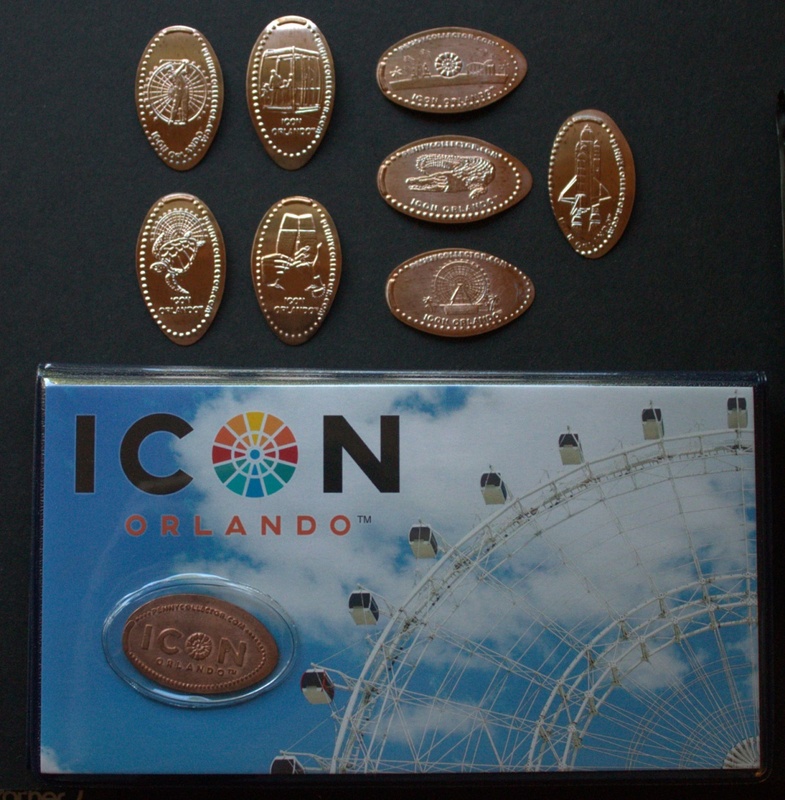 The Frozen design was previously available at Hollywood Studios, but the Pilot Mickey and Pilot Stitch coins are entirely new designs. Designs: Despicable Me Minion Mayhem logo; Gru; Anges & Kyle; Minions.